After 2 long days of driving, we found a great camper stop near Salzburg, which would be home for two nights. That meant we had a whole day to explore Salzburg. 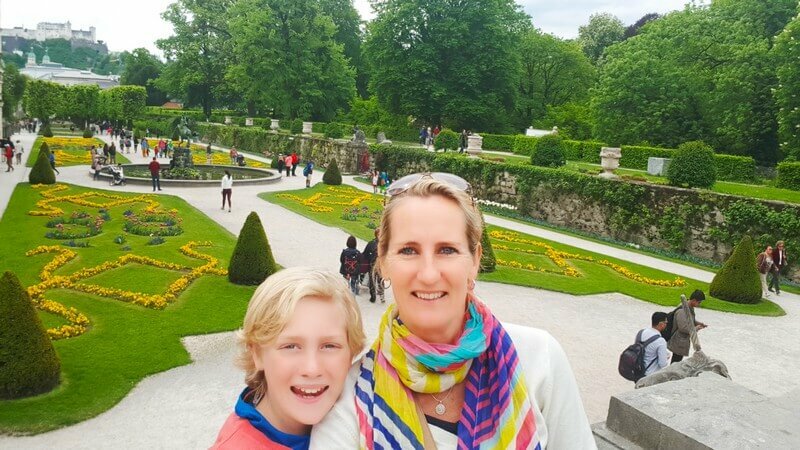 There is so much to see and do but everything comes at quite a hefty price in this town – €11 to go into Mozarts Birthplace, €13 to go in the funicular up to the castle, etc. They do have a fabulous alternative though! It’s the Salzburg card and you pay €25 adult & €15 for kids and you get to use any transport and see virtually all the sights for 24 hours. It includes the funicular ride, the riverboat cruise, all the museums and we got 20% discount when going down the Salt Mines. It was a real win! We caught the bus into town and went to Mozarts House and the house in which he was born. 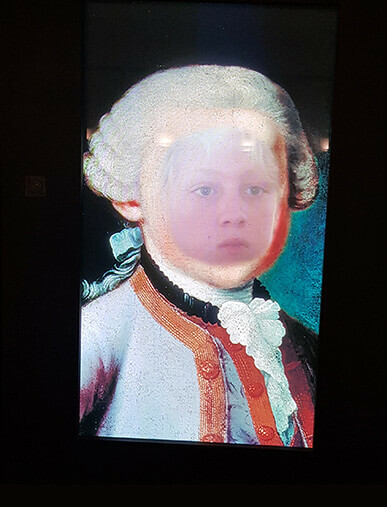 There were some interactive elements at Mozarts house, one of which projected photos of Mozart at various stages of his life. You could pop your own face on top, which was lots of fun. We strolled through the beautiful Mirabelle Gardens with hanging wisteria and patterns of colorful flowers. We crossed the Makartsteg bridge which is laden with love locks and made our way down to the riverboat for a cruise. 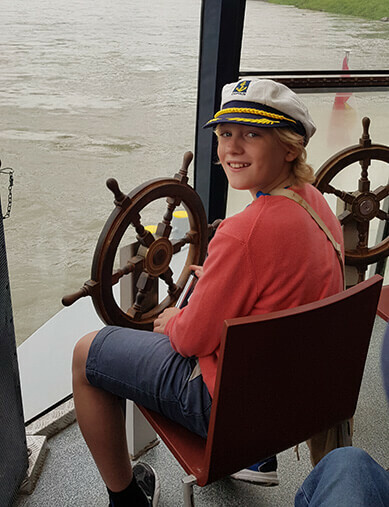 Tai got front row seats, with captains hat and telescope and his very own ship’s wheel. The way he was spinning it, I was grateful he wasn’t the real captain! 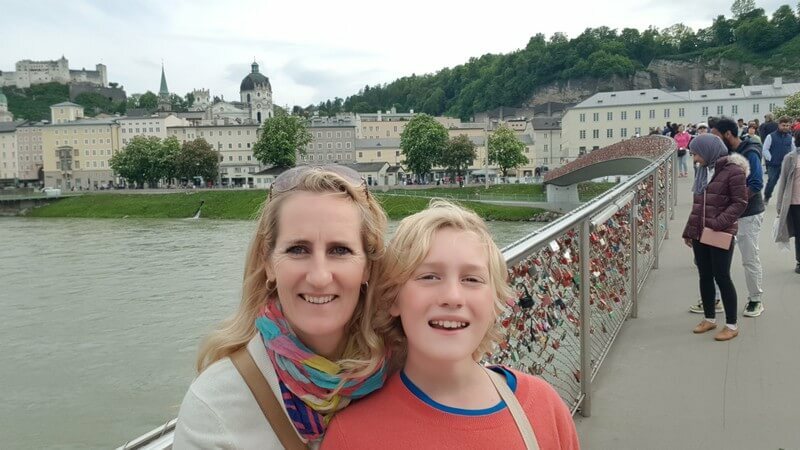 During the boat cruise, places of interest were pointed out, the history of Salzburg was explained and we were regaled with stories about famous visitors and local people alike. It was very fascinating and very well done in both German and English. For a grand finale, they made the boat “dance”, by turning in circles and figures of eight, to the sounds of Johan Straus’s Blue Danube Waltz. We zoomed up the side of the mountain in Monchsberg’s Lift where we had the perfect panorama of the city before us. We popped a few cents into the telescopes for an even more amazing view. There was a winding trail leading through the forest so we decided to follow it. The path meandered along the top of the ridge with occasional viewing points from which we could see snow on the Alps to the East. We finally ended up at the Hohensalzburg Fortress, which really is enormous and how they built it right up on such a steep hill makes the mind boggle. There were too many tourists all jostling through the corridors so we had a quick look around, checked out the marionette museum and then for the highlight – caught the funicular down to the Salzburg Cathedral, where a group of elderly men was playing a life-size chess game. It wouldn’t be a trip to Salzburg without a wander down the Getriedegasse – the most famous road in Salzburg. There was one particular busker who was playing classic songs using wine glasses as instruments. I’ll have to post a video of that! The next morning we were heading for Slovenia and en-route was the Salt mines in Berchtesgaden in Germany, so we had to stop. I have to say that going down the salt mine has to be the highlight of our trip so far! They didn’t allow cameras inside so no pics. We all had to put on overalls, then hop onto a long single file train. After a few minutes, we stopped and then walked for the rest of the tour. The mine is on different levels and to get from one level down to the next, they have wooden slides. Oh, my word, what fun they were! Tai loves anything to do with rocks, minerals, caves, and mining. I’m sure you’ve all seen Himalayan Salt Lamps? Big pink chunks of salt? Well, the passageways had big chunks of salt dotted all along. I think Tai licked the walls from start to finish! Lol!! 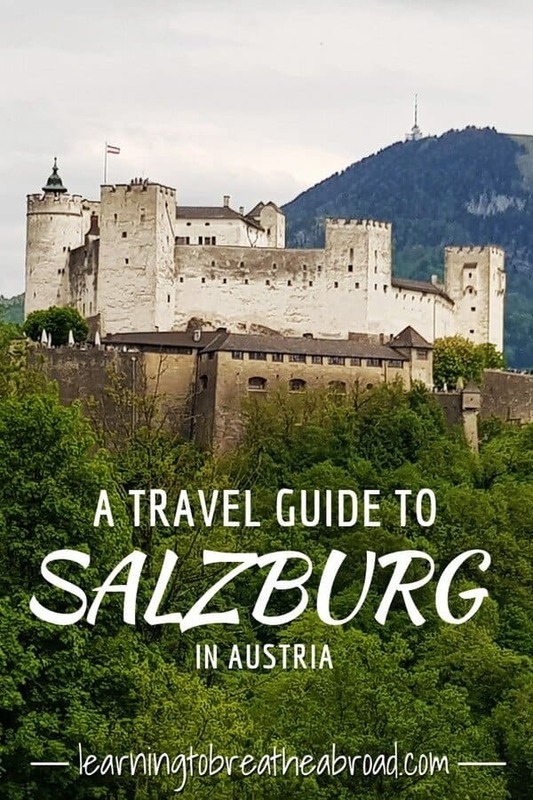 If you are near Salzburg it’s an absolute definite to do! We stayed at Camping Kaserne. Perfectly flat pitches, brand new facilities, friendly staff and full services. We moved Miles to right in front of the office to get good wifi as the signal wasn’t so good further away. Bus #21 takes you into Salzburg and comes past every 15 minutes. There is a supermarket just across the field.